Mario and Goombella inside the shop. 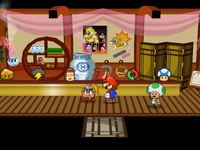 The Souvenir Shop is a shop located in Glitzville and managed by a Green Toad in Paper Mario: The Thousand-Year Door. Most of the items it sells can't be easily obtained elsewhere. This page was last edited on September 16, 2018, at 12:23.